These recent changes have ushered in a fourth distinct period in the modern history of Southwest border enforcement. The first began in the 1980s, when growing concern over illegal immigration contributed to the passage of two major laws: the Immigration Reform and Control Act of 1986 (IRCA) and the Immigration Act of 1990, which both authorized sizeable resource increases for the U.S. Border Patrol, the agency in charge of enforcement between ports of entry. Nonetheless, apprehensions of unauthorized immigrants at the Southwest border—a proxy measure of illegal border crossers—averaged 1.1 million per year in the decade after IRCA’s passage. Implementation of the Border Patrol’s first National Border Patrol Strategy initiated the second period of border enforcement in 1994. Earlier enforcement had been mainly undertaken at some distance from the border, and most decisions about deploying Border Patrol resources were made at the local or sector level. The 1994 strategy called for surging personnel and infrastructure along the immediate border line, with a focus on the areas with the largest numbers of apprehensions, beginning with the border’s two biggest metropolitan areas: El Paso and San Diego. While the total volume of apprehensions was unchanged over the next decade, apprehensions fell in the El Paso Sector by two-thirds and in the San Diego Sector by 80 percent. The current fourth phase of Southwest border control, beginning in 2012, is fundamentally different from the earlier three. Apprehensions are flat or falling in eight out of nine Southwest border sectors, but surging in Rio Grande Valley (RGV), the easternmost sector. The drop in apprehensions is most notable in the Tucson Sector, which recorded an 86 percent decline from 2000 to 2014, with 88,000 in 2014. Meanwhile, apprehensions in RGV climbed from 60,000 in 2011 to 256,000 in 2014—a 326 percent increase in just three years. The RGV Sector accounted for 53 percent of border-wide apprehensions (256,000 out of 479,000) in 2014, the highest proportion ever recorded in a single sector. Source: For all years but 2014, U.S. Border Patrol, "Southwest Border Sectors, Total Illegal Apprehensions by Fiscal Year," www.cbp.gov/sites/default/files/documents/U.S.%20Border%20Patrol%20Fiscal%20Year%20Apprehension%20Statistics%201960-2013.pdf; for 2014, U.S. Border Patrol, "Sector Profile - Fiscal Year 2014," http://www.cbp.gov/sites/default/files/documents/USBP%20Stats%20FY2014%20sector%20profile.pdf. Even these numbers fail to capture how much has changed along the border. In 2014, for the first time, non-Mexicans (overwhelmingly from the Northern Triangle countries of El Salvador, Guatemala, and Honduras) accounted for a majority (53 percent) of people apprehended at the Southwest border. Non-Mexicans accounted for 75 percent (193,000 out of 256,000) of those apprehended in the RGV Sector. By comparison, non-Mexicans accounted for just 6 percent of Southwest border apprehensions between 2000 and 2009. Perhaps most strikingly, unaccompanied children and family units comprised primarily of women and children accounted for 29 percent (137,000) of Southwest border apprehensions in 2014, up from 13 percent in 2013. These changes were driven by a recent acceleration in child and family migration from the Northern Triangle. Emigration of children and families stems from a complex mix of factors, including pervasive violence, poor economic opportunities, and the presence in the United States of family members ineligible to sponsor them for lawful immigration as a result of their own lack of full legal status. While Mexican border crossers in earlier periods were overwhelmingly deportable under U.S. immigration law, recent Central American arrivals present a classic “mixed flow:” many are deportable, but a large number (mostly women and children) have valid asylum or other humanitarian claims. Second, the high volume of mixed flows highlights the need for faster and fairer immigration hearings. Given the dangerous conditions in Central America, many arriving immigrants have an opportunity to plead their case for humanitarian relief before an immigration judge, meaning the United States should not employ fast-track deportation proceedings in these cases. But long backlogs in immigration courts leave apprehended women and children in limbo for years—ineligible for immigration benefits, but not yet subject to deportation. The delays also encourage additional illegal migration by sending a message that child and family arrivals from Central America will not be deported, at least not for a period of months or years. Third, changes in the demographics and motivations of border crossers challenge core elements of U.S. border control strategy. 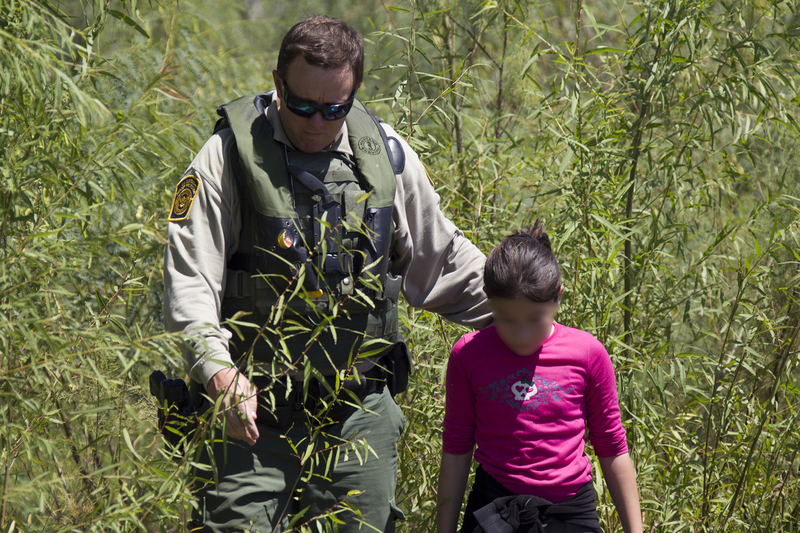 The Border Patrol deters repeat crossers by imposing burdensome consequences during the deportation process, including expedited removal, repatriation through remote ports of entry, and criminal charges that carry prison time. These consequences were designed to deter Mexican men, but women and children generally have the right to a hearing and cannot be given prison time for illegal re-entry. Deporting Central Americans is also complex because they must be flown to their home countries—a more expensive and logistically difficult proposition than deporting Mexicans at land ports of entry. These challenges raise the question of what consequences might deter unauthorized Central Americans while still meeting the responsibility under U.S. and international law to protect vulnerable migrants. More fundamentally, U.S. border control strategies seek to deter border crossers through the threat of enforcement, but people fleeing desperate conditions may not be easily discouraged, particularly if their lives are at stake. U.S. Border Patrol. N.d. Southwest Border Sectors, Total Illegal Apprehensions by Fiscal Year. Available Online. ---. N.d. Sector Profile - Fiscal Year 2014. Available Online. U.S. Customs and Border Protection Commissioner R. Gil Kerlikowske, who assumed his duties in 2014, lays out his vision and discusses his priorities for the agency as part of MPI's Leadership Visions series.